We find our first glimpse of 'Chloe' in the pages of Harrison Weir's classic work Our Cats, which was published in 1889. From this book we gain some of our best insights into the early history of a number of our most prominent breeds. This is particularly apparent within the foundations of the Silver Persian, or 'Chinchilla'. 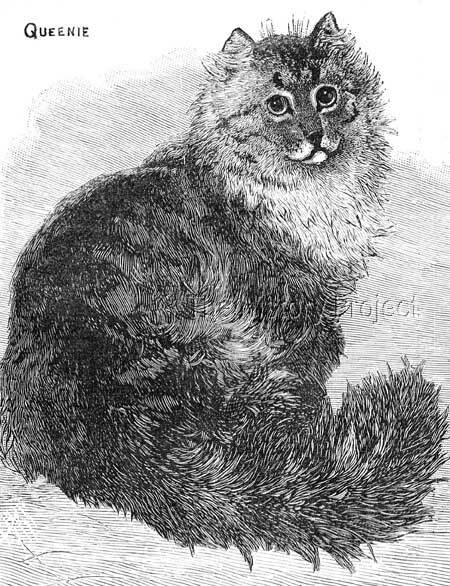 The images provided by his own hand, also give us our clearest indication of the qualities of some of the earliest Chinchilla cats, predominantly due to his exceptional eye for detail, coupled with his specialist knowledge of cats. His illustrations display far more accuracy than those from alternative sources, which so often appear to 'miss the mark' when it comes to the details that concern us most; namely type, coat, colour and pattern. 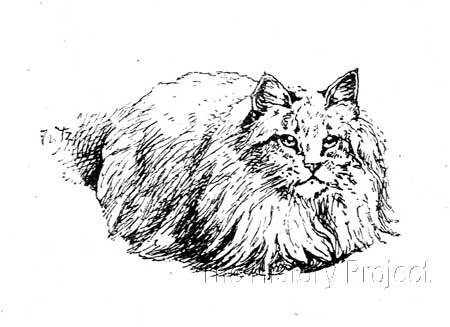 This is clearly seen when we compare his imagery of cats such as 'Sylvie', 'Chloe', 'Dinah', 'Silver Lambkin 1', 'Silver Lambkin 2' and even 'Fez' for instance, as against the images of 'Fluffy II' and 'Queenie', by an alternative journalistic illustrator with no knowledge of the breeds. 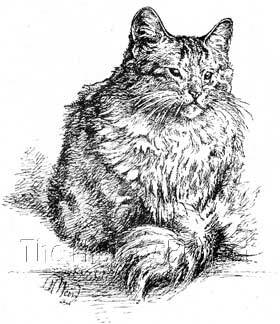 Both 'Chloe' and 'Dinah' were owned and exhibited by Miss Florence Moore, an experienced breeder and exhibitor of Silver Tabbies bred down from Mrs. Brydges noted cats, which were among some of the first long-haired cats imported into England2. 'Chloe', through her sire, was both a forerunner to, and relative of, the famous 'Ch. Silver Lambkin', both being grandchildren of 'Chinnie', the 'mother' of all Chinchilla's, owned by Mrs. Vallance. 'Chloe' was born on 30th April, 1887, (NCC: 1051), bred by Miss Florence Moore. Her sire was Mrs. Vallance's male, 'Fluffie II', himself a son of none other than the noted 'Chinnie' so well known to us today, as the 'Mother of the Chinchilla'; and from whom it is surmised, the clear coated silver Persian cat takes its name. 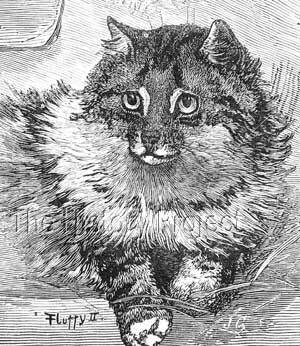 What is not so generally well-known, is that the parentage of 'Fluffy II' is exactly the same as that of 'Beauty of Bridgeyate', the dam of immortalised 'Ch. Silver Lambkin', considered to be 'The Father of the Chinchilla' breed variety. Although we have no registration records available to us for 'Fluffy II', it does not seem inconceivable that he could have even been a litter brother to 'Beauty of Bridgeyate', (NCC:1885) who was born 1st April, 1885. The dam of 'Chloe' was Miss Moore's 'Daisy', (NCC:1050), born in May 18854. From her registration records we know that she was sired by 'Fez' and out of 'Judy' and if we turn to a passage written by Mrs. 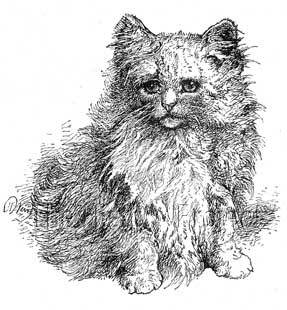 Balding (formerly Miss Dorothy Gresham), in The Book of the Cat (1903), we find an illuminating linkage to Mrs. Brydges original imports and 'The Silver Lambkins' and a full sister to 'Daisy' named 'Queenie', also owned by Miss Florence Moore. "Another Chinchilla of the early eighties was Miss Florence Moore's 'Queenie,' who would, had chinchilla classes been provided at that time, have been loaded with championships and honours. In colour she was as light as any of our present-day celebrities, and might easily, from her freedom of markings, have earned the dubious compliment of the uninitiated so highly prized by owners of chinchillas of being mistaken for a grubby white. 'Fez', the sire of Miss Moore's 'Queenie' and 'Daisy', and maternal grandsire to 'Chloe'. 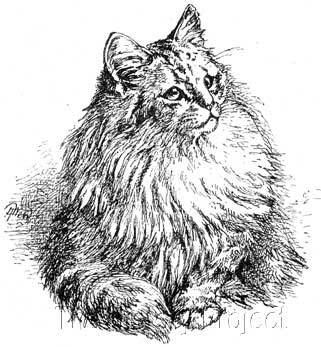 "Mrs. Brydges can claim the distinction of having owned, something like half a century ago, some of the first long-haired cats ever imported into England. 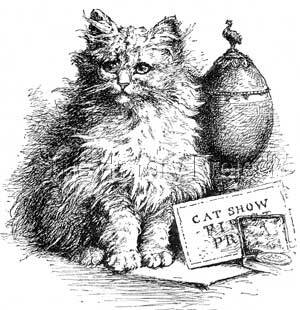 A coincidence worthy of note is that although there is no record of her having bred or possessed a chinchilla, two never-to-be-forgotten pairs of chinchilla kittens, Miss Florence Moore's 'Chloe' and 'Dinah', winners of first and medal on three successive occasions at the Crystal Palace, Brighton, and Bexley, 1887 (they being the only chinchillas at any of these shows), and Miss Gresham's 'Silver Lambkins,' who swept the board in 1888, winning the Specials at the Crystal Palace from forty-six pairs of other competitors of all colours, - could in each case trace descent to the Cheltenham stock, 'Chloe' and 'Dinah' through the aforementioned 'Judy' and the 'Silver Lambkins' through their sire 'Rahman', also bred by Mrs. Brydges. 'Dinah' does not appear in any register and although shown side by side with 'Chloe' we cannot confirm, without question, whether she was a full sibling of 'Chloe' or not, but as with no evidence to contradict that possibility, it does at least seem likely. Regretfully, neither of Mary Gresham's 'Silver Lambkins' survived into adulthood, and we have no record of progeny from either 'Chloe' or 'Dinah'. However, their later cousin, 'Ch. Silver Lambkin', lived an exemplary long life, 1889-1906, during which time he sired a wealth of quality silver males and females and over time earned for himself, worldwide notoriety as the 'Father' of the Chinchilla. The story of 'Chloe' as well as 'Dinah' and the two young 'Silver Lambkins' by 'Rahman' gives us an incredible insight into how a variety is established. It shows us, how the meshing of related lines can evidence the genetic potential in a bloodline, and although establishing a breed or variety is often difficult and drawn out beyond description, even fraught with tragedy and despair, it is also extremely rewarding when at some point, the hard graft eventually produces a successful outcome. This particular history highlights that we should be thankful to both Mrs. Brydges and Mrs. Vallance for the early foundation behind 'THE' Ch. Silver Lambkin; and then to the Misses Gresham, (Mrs. Balding and Mrs. Bridgewater), for their amazing stewardship, protection and distribution of his subsequent progeny and much needed outcrosses. "Developing and promoting a new breed of cat is an endeavour that requires the patience of Job, the wealth of Midas, the wisdom of Solomon and the tenacity of the Terminator."